(From left) Judson Rusk, Calvin Drake and Seaton Bryan play Nyctophobia, a board game where players are unable to see the board. The three traveled to SHUX earlier this fall to try new board games and meet the creators of some of their favorites. The tourism season has come to a close and that means that things in Southeast Alaska are slowing down for the winter. Some spend their winters adventuring in warmer places, vacationing on tropical islands, trying to miss as much of the rain and cold as they can. But a group of Sitkans decided to take a vacation to an equally cold and rainy place- Vancouver, B.C. for a board game convention. Inside a gargantuan convention hall in the middle of hundreds of tables covered in black tablecloths, sit groups of four to five conferring amongst themselves. At one of those tables, a handful of Sitkans are in their own world, wandering through some imaginary woods, trying to escape from a vicious axe murderer. They’re playing Nyctophobia, a board game where players never actually see the board. They wear plastic blackout sunglasses, as one player who can see guides their hands. They feel each piece on the board, stumbling blindly through the forest looking for rocks, stopping at trees, and desperately searching for the car so they can escape. 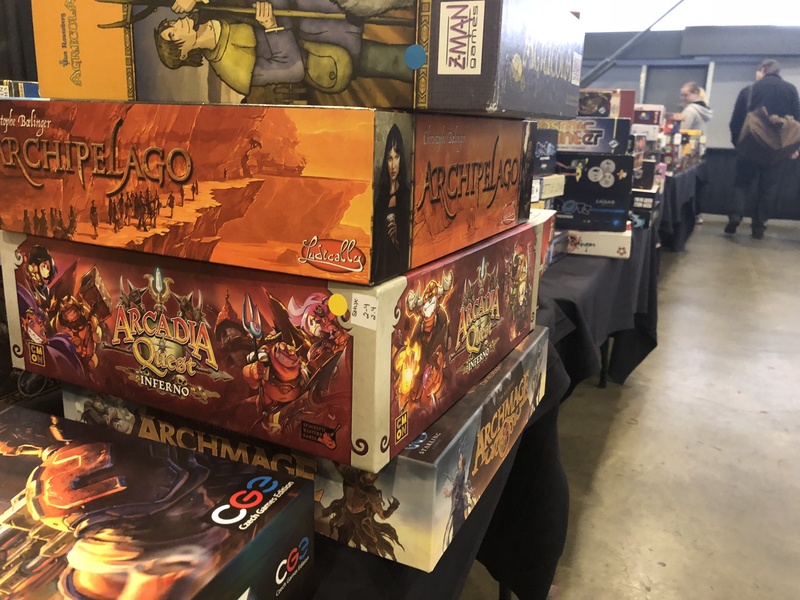 They’ve traveled to SHUX, a convention for tabletop gamers to gather and try some new board games on the market. In its second year, SHUX is put on by Shut Up and Sit Down, a team of people who review board games professionally on Youtube, and they produce some of the most popular podcasts and videos in the tabletop gaming community. Sitkan Seaton Bryan relies on their reviews to decide what games to add to his growing library. While Bryan has been into it for a while, many more people are dipping their toes in the tabletop world. Board games have seen a massive resurgence over the past ten years. SHUX co-founder Matt Lees has a theory about why the market is booming. And it’s not just about loading up on new cardboard. For people from a small town like Sitka, it’s nice to be able to come to a place where there is literally a convention hall half Sitka’s size, filled with 2,000 people in the building that share their passion for tabletop gaming. “Just being able to run into people that saw what game you were playing and say “Oh I love that game!” or do that yourself, walk around, see something you’ve never played before, sit down and find out, it’s amazing,” Bryan said. Board game culture has roots in Southeast Alaska. In Juneau, Jack Eddy runs a board game review site of his own, The Cardboard Herald. He produces podcasts and videos, and he’ll likely have a table at Juneau’s own growing board game convention in January, Platypus Con, which is in its fifth year. “You may be interested to know that two of the original Magic the Gathering artists are actually from Sitka, Alaska- Anson Maddocks and Mark Tedin,” Eddy said. “They actually met at Sitka elementary school, and went to college together. That’s no surprise to Eddy, who thinks Southeast is the perfect setting for breeding creative energy and fostering human connection. And back at SHUX, Matt Lees has an idea of why Southeast Alaska may have a strong tabletop gaming culture. And Bryan and his friends did give it a go – they left Vancouver with suitcases full of board games, back to Sitka stocked up on cardboard and prepared for the winter.